We offer some of our nationally accredited programs as public programs to individuals and small groups under our specialist division, Workplace Dimensions in Melbourne, Sydney, Brisbane, Canberra. You’ll get the same high quality programs Leadership Dimensions deliver to Australia’s top tier organisations in a face to face format plus coaching. People who learn with Workplace Dimensions tell us they are motivated to gain their qualification in an engaging face to face environment with a skilled and experienced facilitator. We’ve designed high impact training with activities created to support the completion of your assessments in the classroom. Some participants, with industry experience may be able to complete their Certificate IV qualification assessments during the program, however course pre-preparation and some after-hours work is required. Should you need further support to complete your qualification after the classroom sessions are complete, the Workplace Dimensions coaching team is available to you. You’ll be able to leverage our experience across many industries, from construction, government, corporate, utilities, mining, aviation, retail, transport, manufacturing, health and insurance. We’ve taken the learning techniques we’ve developed to train thousands of learners in Australasia’s largest organisations and made them available to you. Our facilitators aren’t the traditional ‘chalk and talk’ type – they bring years of real world, industry specific experience to their training, combined with the latest learning methods, to make sure your training experience is tailored to you and the way you learn best. Our facilitators train in a way that makes the information stick and give you the skills to use what you learn in the training room, in practice in industry. You may be eligible for fully or partly funded places in our Certificate IV or Diploma programs, both for individuals and work groups. 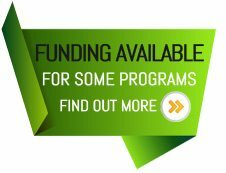 View our funding page here or contact us below.